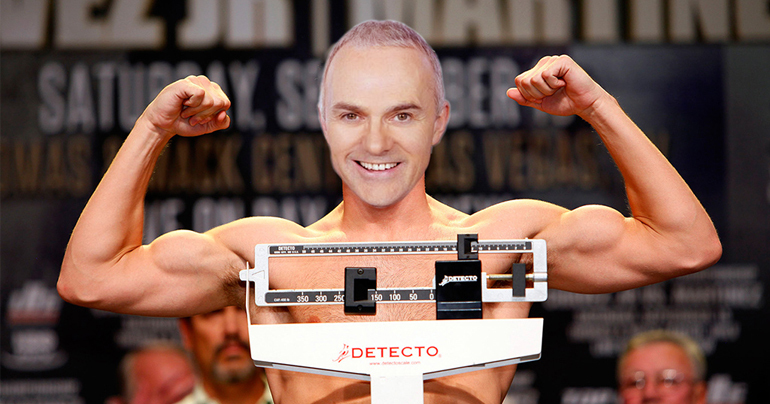 Just days before of their hugely anticipated Las Vegas prize fight, the Ulster Fry has learned that boxing rivals Floyd Mayweather and Manny Pacquiao are not only fighting for their pride and hundreds of millions in prize money – but also the exclusive chance to fight UTV weather villain, Frank Mitchell. The showdown was organised by incensed US boxing promotors recently after they were alerted to Mitchell’s continual UTV slabbering that ‘May weather is pure shite’ and would ‘probably be beaten down the whole time’. The bout is earmarked for the Ulster Hall this November with local promoters scouring boutiques and handbag shops across the Province for a purse big enough to hold the prize fund – £80m worth of Northern Bank’s famous plastic fivers. This is not the first time that Mitchell has faced the world’s sporting elite of course. In 1987 he was famously challenged to a snooker match by an angry Alex Higgins after admitting ‘he couldn’t wait to see the back of thon f**kin hurricane’ live on UTV. Surprisingly Mitchell actually beat Higgins, but later revealed that he had ‘loads of snooker practice’ – after years of public scepticism about Whirlwinds let to a series of ‘manners lessons’ by Jimmy White. The Pacquiao camp, who had previously shown little interest in the Belfast prize-fight, finally waded into the drama this morning after Mitchell made a dramatic UTV-turn last night to declare that ‘May weather is looking far better’ but could yet ‘give ye a good lashing’. Pacquiao, speaking with badly broken English told reporters “Hi Mitchell, ya slabber. I’m gonny knock yer pan in so am ar!” before asking translators what the Filipino is for ‘boot up the hole’.